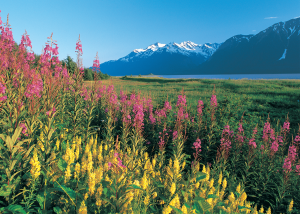 During the summer months in Alaska, fireweed plants thrive across the state. The green plants, colored with fuchsia petals, scatter from roadsides to edges of forests, and even backyards. The plant is often collected for its medicinal properties, and the paper-thin petals can be used to make fireweed honey. Picking the petals can be a tedious, but therapeutic task. Collecting fireweed and making honey is one of many cultural activities Denaa Yeets’ promotes. Denaa Yeets’ is Athabascan for “Our breath of life” and is a prevention program for adults who may be at risk of suicide and want to increase resiliency skills. Customer-owners who enroll in the six-month program will create a safety plan with a Denaa Yeets’ case manager. Safety plans identify and designate a personal support system, build resiliency and coping skills, and connect and increase support systems. A support system can be one individual, a group of people, or a healthy activity the customer-owner can turn to when needed. In addition, they work together with their case manager to identify individual goals. Case managers, in essence, provide a family extension by lending guidance, sharing, and instilling the idea that one can be successful during treatment and beyond. Denaa Yeets’ employees connect with their customer-owners on a personal level, through cultural activities. Activities include fishing, sewing, picking fireweed and berries, and more. Case managers believe support and healing not only happens in the office, but also outside in nature. “Being outside provides a safe space where stories can be shared, where guards can be let down. It connects individuals to subsistence activities that are part of their culture. In a way it grounds them to their culture, which is a great strength,” said Michelle Wyrick, behavioral health case manager at Denaa Yeets’. Enrolled customer-owners learn life skills; a life skill can be as simple as collecting fireweed. These activities plant a seed of hope—to look forward to the next activity, to the next summer of collecting fireweed. Positive experiences give customer-owners a genuine life experience to be proud of. “We uplift each other by sharing our breath of life,” said Deena Kelly, behavioral health case manager at Denaa Yeets’. Speak, connect, and act if someone you know is exhibiting signs of suicide. It is important to remember to have no judgement and to listen. Do not leave the person alone, identify a safe person to talk to, remove access to objects that could be used in a suicide attempt, take the person to an emergency room or seek help from a medical or mental health professional, or call the U.S. National Suicide Prevention Lifeline at (800) 273-TALK (8255).